The RHSQ wishes to congratulate and honour the achievements of our member and John Douglas Kerr Medal winner Lorna McDonald who turned 100 on 10th August 2016. Lorna moved to Rockhampton with her family in the 1960s and has continued to live there to the present day. Studying externally, Lorna completed degrees at The University of Queensland. In 1975, she completed her Masters degree on land settlement in the northern districts of Port Curtis and Leichhardt. In 1985, she received a PhD for her thesis on the history of the cattle industry in Central Queensland. 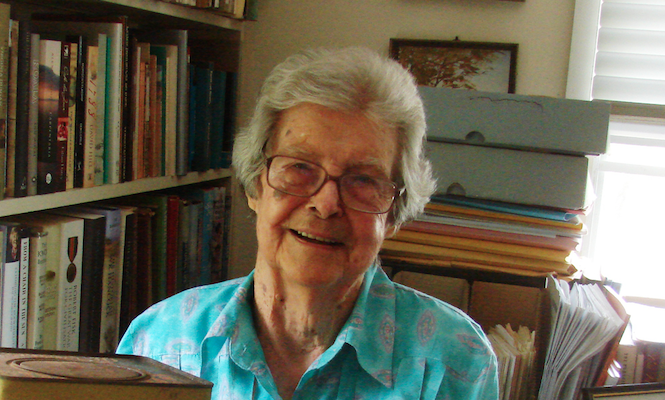 Having written numerous histories of the Central Queensland region, Lorna was appointed Rockhampton Historian from 1976 to 1980 and Gladstone Historian from 1984 to 1987. Lorna has contributed significantly to the Society’s journal and to our conferences. She continues to work as a professional historian! Her first book, Rockhampton: A History of City and District was published in 1981. This was the first of many books for the well-known Queensland historian. Lorna has gone on to write, edit and contribute to over 20 published books. She has received numerous awards for her work, including the John Douglas Kerr Medal of Distinction from the Royal Historical Society of Queensland and Professional Historians’ Association in 2009 and is a Fellow of the Federation of Australian Historical Societies. She was also awarded an OAM in 1995 for her history work in the community. Image courtesy of University of Queensland Library.